Balmora is a city found in the West Gash region of Vvardenfell. Despite its Hlaalu architecture, the city is actually a stronghold of House Redoran. This is due to an agreement reached between houses Redoran and Hlaalu. 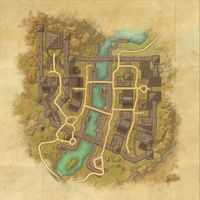 Balmora Objective: Help locate the Redoran councilor's missing daughter. Like Blood From A Stone: Venture into the depths of an old ebony mine to investigate a mystery. The Memory Stone: Fulfill an elderly Dunmer's last wish. 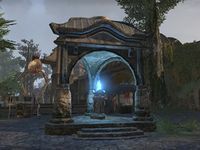 The Randy Netch Inn — A two-story Hlaalu-style inn found in Balmora. Fanisea Saram is a traveling merchant who walks the road north of Balmora with her guar, Peony. 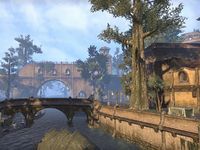 Balmora Wayshrine is located southeast of the city, amidst the guild kiosks and Mages Guild tent. This page was last modified on 16 February 2019, at 16:55.